The brother of Babes in the Wood murder victim Nicola Fellows died just weeks before he saw justice for the death of his sister. Jonathan Fellows, 46, was found dead at a homeless shelter in Worthing on September 5, last year, an inquest at Crawley Coroner’s Court heard on Tuesday (February 12). Illicit heroin, morphine, and benzodiazepines were found in his system, as well as ethanal in his blood, the inquest heard. Assistant coroner Joanne Andrews recorded an open verdict with no suspicious circumstances. She said she could not determine if he intended to take his own life, as he did not leave a note, nor if his death was an accident. 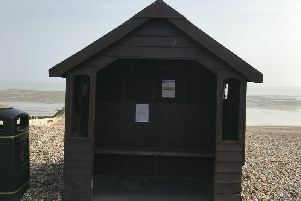 The inquest heard how Jonathan was living at the homeless shelter in Lyndhurst Road, Worthing, but had not been seen by staff all day on September 5. The homeless shelter in Lyndhurst Road, Worthing. Staff gained entry and found him unresponsive on his bed, the inquest heard. Lager cans were found on the floor beside him, but there was no note or evidence of drug use, the inquest heard. Paramedics were called, who confirmed his death. The inquest heard how Jonathan struggled to cope with the death of his sister. He was working but would drink at the weekends ‘to excess’ and he got into trouble with the police and spent some time in prison. The 46-year-old lived in Brighton with his parents and sister Nicola before she was tragically murdered in 1986. When her now-convicted killer Russell Bishop was found not guilty at the time, this had a huge impact on Jonathan, the inquest heard. Jonathan and his family moved back to London, until his parents separated in 1993, the inquest heard. He and his mother then moved back to Brighton. The inquest heard how he had a five-year relationship, but moved back with his mother when this broke down. He then got married and had two children who he ‘idolised’ but the marriage ended in divorce. Jonathan had slept rough on the streets of Worthing, the inquest heard. He also suffered with post-traumatic stress disorder and underwent therapy for the loss of his sister. When news broke that Bishop, 52, was going to be retried for the murders of Nicola and Karen Hadaway, 32 years after their deaths, Jonathan was looking forward to going to court and getting justice for his sister, the inquest heard. But he tragically died just weeks before the eight-week trial began at The Old Bailey in London. Bishop was found guilty for the schoolgirls’ murders on December 10. He was jailed for life the following day. Assistant coroner Joanne Andrews passed on her ‘sincere condolences’ to Jonathan’s family who she said ‘must be going through a very difficult time’. She added: “The cause of his death was he was found unresponsive at his home having not been seen for some time. “He had heroin and morphine in his system, as well as benzodiazepines and ethanal in his blood. A post-mortem examination found the cause of death to be mixed drug and alcohol overdose, alcohol dependence syndrome, and cirrhosis of the liver.